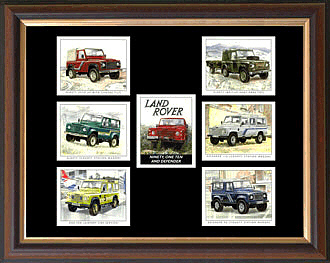 A fine selection of quality collector cards featuring all the main Land Rover models. The sets are professionally mounted and framed with an acryllic glass window at both the front and back so that the cards can be seen on both sides, as all the cards contain detailed information on the reverse. The frames are despatched in a special purpose designed box to minimize any possible damage in transit. This second edition of Land-Rover Series I Collectors Cards covers seven classic Land-Rover models produced between 1948 and 1958. This set covers Series II and IIA Land-Rover models from 1988 to 1971, a neater design and better equipped than the Series I it replaced. Set covers Series III Land-Rover models from 1971 to 1985, a more refined and better interiors than the Series II it replaced. This set covers the Series III Land-Rover models from 1971 to 1985. These were more refined and had better interiors than the Series II it replaced. This series of cards is a pictorial celebration of the coil-sprung Land Rover, covering the Ninety, One Ten and Defender models produced after 1983. The ultimate four wheel drive leisure vehicle that celebrated 25 years of continuous production in 1995 is depicted in this collectors cards set.